FIB announces day splits plus more artists join the line-up! 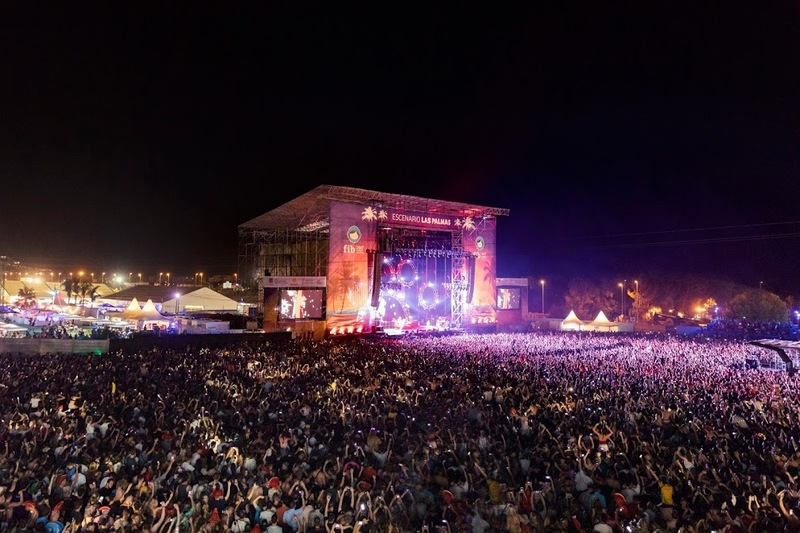 Festival Internacional de Benicàssim has been delivering this year yet again, with stellar acts joining the line-up for the 4 day festival on Spain's Costa del Azahar. Day splits have been revealed, with Travis Scott headlining Thursday, The Killers headlining the Friday night, Pet Shop Boys on Saturday and Liam Gallagher on the Sunday night. The balance of artists and genres on each day is phenomenal, ensuring everyone has someone to see. Along with these splits came the addition of some more acts which we are extremely excited about! Manchester band Pale Waves will be heading to the festival on the Thursday night, one of our Sounds of 2018 picks this year there is no doubt that they will put on a show for sure. Signed by Dirty Hit and having toured with The 1975 last year has certainly put Pale Waves in good stead for 2018. They keep releasing catchy tunes and selling out their UK shows. Their rise to the top of the indie pop world is definitely happening. Pale Waves always perform a stellar set, this will be the band's first time playing FIB and it certainly won't be their last. Make sure to check them out whilst you can! The addition of UK indie rock band The Horrors on the Saturday is absolutely brilliant! Having released their incredible fifth studio album 'V' last September, the band are back with a vengeance. The record received critical acclaim from industry and fans alike, gaining 5/5 stars in The Guardian's review. Its combination of familiar yet innovative soundscapes ensures the tracks are memorable yet intricately written in terms of lyrics and instrumentation. Particular favourites are shoegaze-80s tinged 'Something To Remember Me By' and the synth heavy 'Press Enter To Exit'. One can only look forward to The Horrors' set at FIB, it's going to be brimming with classics as well as new favourites! Also playing on the Saturday are New York art-punks Bodega. Bodega are certainly causing quite the stir on the indie music scene, having played SXSW and received great reviews to currently conquering the UK, with multiple London shows and shows at The Great Escape this week. This band are definitely something special, their riff heavy, chorus laden, chanting tunes leave the listener wanting more. Considering they only have 3 songs on Spotify, the excitement around this band is evident. The lyrics in 'Can't Knock The Hustle' are absolute genius, their repetitive nature encourages the audience to sing along and by the second verse it just feels that everyone is in the same situation together. I can't recommend seeing this band enough, make sure to check them out at FIB! Other great additions include Chase and Status playing a live set on the Saturday night, as well as Rag'n'Bone Man bringing his rich, soulful voice on the Friday. Spanish indie band The Parrots are joining the Sunday (their sets are always brimming with energy so don't miss this one), and Finnish pop songstress Alma also plays on Sunday. FIB takes place from the 19-22 July and 4 day tickets as well as day tickets can be purchased from here.